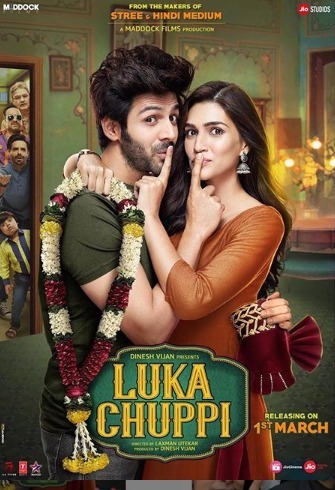 The trailer of Kartik Aaryan and Kriti Sanon starrer Luka Chuppi, directed by Laxman Utekar, is out. The film also stars Vinay Pathak, Pankaj Tripathi and Aparshakti Khurana. Slated to hit the theatres on 1st March, Luka Chuppi revolves around live-in relationship drama between Kriti and Kartik, and describing the premises of the film is the tagline, “Experience Live-in with Sah parivar”. From the trailer, we understand that while Kartik is a star reporter of a local TV channel, Kriti is a Mathura-based girl who returns to her hometown after studying in Delhi. Kartik is shown proposing to Kriti for marriage but she, instead, proposes to try out a live-in relationship before taking the big step. However, things go for a toss when Kartik's parents come to live with the couple.